Vanilla is a such a staple of our spice cupboards we hardly give it a second thought. It’s time to change that. The best tasting desserts use top quality ingredients. When it comes to vanilla that’s an expensive statement. Did you realize that you can make your own vanilla extract? It’s beyond simple. You need a mason jar, a couple of top grade Bourbon-Madagascar vanilla beans and some vodka. That’s it. You also need a couple months to let it steep. But how cool is it to tap into your own private vanilla extract reserves for your recipes? You can also bottle it up and give it away as a present for just about any occasion (speaking from experience, the recipient will be so impressed). Take 2 vanilla beans. Top quality beans will be labeled Madagascar or Bourbon Vanilla and will be about 15 cm (shorter beans are given a lower quality grade). Because flavor matters more than aesthetics for extract the B grade beans are fine…and less expensive. Slice the beans open along their longitude leaving the last half inch together. Put the beans in your jar. Add 1 cup of vodka, brandy or rum. Vodka provides the highest alcohol concentration. Brandy and rum contribute a little of their own flavor. I prefer the vodka. Seal up your jar and store in a cool dark place for 12 weeks. Longer is encouraged. It will just make the extract stronger. 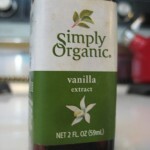 After your vanilla is fully steeped fill up a smaller bottle to keep in your kitchen. Just pour more vodka into your original jar to replenish what you used. If you want to give some as a gift snip off about a 1″ piece of bean and put it in the jar with the extract. Explain to the recipient that they can replenish their jar too. P.S. The name Bourbon vanilla has nothing to do with the drink. It’s named after the Ile Bourbon the former name of an island in the Indian Ocean…and that name came from the France’s House of Bourbon. (Go here if you’re hungry for more on vanilla’s historic soap opera). Order premium Madagascar vanilla beans here . vanilla whenever I need it?? How wonderful is that!!! The other night we were having dinner with some friends and one man – yes grown man, did know about saffron. Didn’t know the flavor or from where it came – so! a whole discussion began about saffron including if we could grow our own crocus and harvest our own… ?? It does come from crocus flowers doesn’t it?? Is there a certain type or species that is better than another?? From the little I know about botany I would think there is probably more than one type of crocus.. So!! My question is this – can I grow and harvest my own saffron?? and what type of crocus should I use, if in fact it does come from crocus. I’m on the case! Yes, saffron is the stigma portion of a crocus flower. Each flower yields about 6 mg of saffron. 75,000 flowers need to be hand-harvest for one pound of spice. As for growing your own, species and environmental requirements, I’ve wondered the same thing so I’ll dig up the info. and share. What a great gift idea! I think you just saved me from shopping for quite a few Christmas gifts. For more info. I made an entire page dedicated to vanilla. Go to Spices A-Z and click on vanilla. Or click the “vanilla” links embedded in the blog post text. I found some wild info. on this supposedly humdrum spice! Wow…brandy! Who knew? So all those bottle of vanilla that have bourbon listed as an ingredient are not accurate. I don’t know why I’d be surprised at that…LOL Most labels are inaccurate at best and purposely misleading at worst! LOL! They’re correct…except bourbon refers to the type of bean, not the alcohol. I was surprised to learn about the brandy too. I’d think it’d impart too much flavor into the vanilla. Once I was out of vanilla extract and substituted whiskey. Totally changed the flavor but it was delicious. I have made this and it is truly amazing, my little sis and I used the actual glass bottle of vodka and we added about 6 beans, i have been enjoying it for about 4 months and it is superb, I don’t think I will ever buy premade again. Such a simple but brilliant idea. I put all sorts of stuff into my vodka bottles but never thought to put vanilla…. I would have never thought to do this…but it is such a brilliant idea! 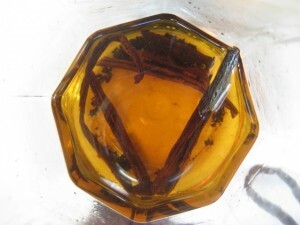 I use a lot of vanilla extract, and I would love to be able to make my own batch at home. If I go out and buy some beans today…I’ll be able to use my very own extract for my cookie baking. Brilliant! Now I am jumping over here from your cardamom post to a few questions about this amazing vanilla process. If making your own homemade vanilla is that easy why isn’t everyone doing it? I use Trader Joes Pure Vanilla and on the ingredient it label it lists, glycerine, water, sugar cane, and vanilla bean extractives. On the front label it has in larger writing Alcohol Free. Is there a reason to have an alcohol free vanilla? What is used to produce an alcohol free vanilla? Once the vanilla is done steeping and you pour a little into a smaller jar, you replenish the vodka to keep it at the original 1 cup? Do you ever need to add new vanilla beans? Do you ever have to begin again or do you always continue to refill the jar with use? If doing this as a gift, how much vodka do you put in a jar to the 1” of vanilla listed? Thanks for helping me get into more of the details with this fantastic vanilla process. I can’t wait to try it and never have to buy vanilla again. Even though making the extract is really easy it’s even easier to grab a bottle off a shelf. 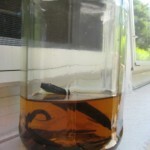 You can make vanilla extract in glycerin. I think it’s 2 beans, 4 oz. water and 12 oz. food-grade glycerin. My guess is that some people want the alcohol-free version for personal, religious or medical reasons. Personally, I believe the alcohol version is the best way to get the richest, purest taste of vanilla’s complex flavor. And you use such a small amount when cooking, you don’t even taste the alcohol; you taste vanilla. I usually give gifts in 2 oz. jars (decorated versions of former extract jars.) My own supply has been providing an on-going source of vanilla for two years and I added a fresh bean about 6 months ago. I go by the highly informal look, smell, taste method. Yes: replenish to the original 1 cup after restocking your supply. You may want to start a couple of jars if you’re an avid baker. As always, thank you for all your insight. Your website site has now peaked my interest even more and it’s comforting to be able to discuss the spices with an expert. Looks like I should get started on this vanilla and dump using the Trader Joes brand…now I am embarrassed to say I even use it. Is the ratio of homemade vanilla to Trader Joes, 1 to 1? Gotta get these instructions printed…I will read on about vanilla. Again thank you, I am sure there will be more questions in my exploration of baking with spices. One more question, do you have a preference on what vodka to use? Whatever you have available! I used Absolut but that’s kind of a premium alcohol for vanilla extract. Just a mid-level vodka ought to be fine. Good luck. I’ve run into a lot of curiousity regarding vanilla extract. I may have to revisit that question! Thanks, maybe I didn’t get your response to the other questions. Is homemade vanilla to a store bought vanilla used in as 1 to 1 ratio? Hope you don’t mind the zillion questions…sure others might be wondering. Just check the freezer…only smirnoff here. Though a premium alcohol might actually be better for premium extract. Just ordered the beans…yippie. I am so excited to try this. Amy, you had a number of great questions so for your convenience and others who are curious about the same thing I gathered them together and put them on one post. Check this out. Hope it helps! Questions Answered: Non-Alcoholic Vanilla? What’s The Ratio of Vanilla in Alcohol?